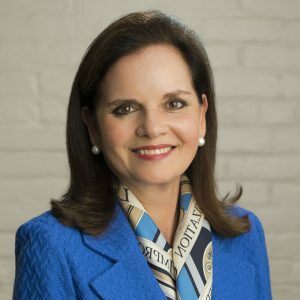 Internationally recognized as a leader in philanthropy, Clotilde Perez-Bode Dedecker is President and Chief Executive Officer of the Community Foundation for Greater Buffalo. She has dedicated her life’s work to improving the lives of those around her. An innovative and visionary leader, she is creating positive long-term change in her community and beyond. For nearly 100 years, the Community Foundation has worked with individuals, families, foundations and organizations to steward their charitable assets. Today, the Community Foundation has grown to more than $485 million and its clients recognize it as a powerful, trusted vehicle to make the most of their generosity. For more than a decade, Clotilde has led the Community Foundation’s strategy to create meaningful community change on behalf of the clients who have chosen to support this work. The Community Foundation brings together partners to advance significant change including Say Yes Buffalo, Greater Buffalo Racial Equity Roundtable and the WNY Impact Investment Fund, to name a few. Seen as a changemaker, Clotilde’s work has attracted more than $93 million to Western New York to support these collective efforts. Nationally and internationally, Clotilde serves as chair of the Foundation Center, a New York City-based organization widely considered the premier source for global philanthropic information. She is also a member of the boards of FSG, Executives’ Alliance to Expand Opportunities for Boys and Young Men of Color, Global Fund for Community Foundations, Green & Health Homes Initiative and Say Yes to Education. In recognition of her civic sector expertise, Clotilde was appointed to the White House House Council on Service and Civic Participation and named co-chair of the U.S. Committee of the United Nations International Year of the Volunteer. Clotilde frequently speaks about the role of philanthropy, community impact and nonprofit governance around the world. Most recently, she presented at the U.S. Partnership on Mobility from Poverty supported by the Bill & Melinda Gates Foundation in Washington, D.C. and the Asia Forum on Philanthropy for Better Cities in Hong Kong. For her contributions, Clotilde has received numerous honors and awards, including accolades from the Points of Light Foundation, the Governor’s Award for Service, the President’s Award for Service and The Buffalo News Citizen of the Year Award. She was named the 2018 Buffalo Niagara Executive of the Year by the University at Buffalo School of Management. She has also received the Dean’s Service Award from the State University of New York at Buffalo Graduate School of Education and the Canisius College Distinguished Citizen Award. An alumna of both institutions, Clotilde received her Bachelor of Arts degree from Canisius College and Masters of Arts degree in Education from the State University of New York at Buffalo. She is a naturalized U.S. citizen and a native of Cuba.